They say rugby is the game played in heaven and certainly to those interested in classical architecture, heaven is somewhere between Mount Olympus and Toowong in Brisbane’s inner-West. 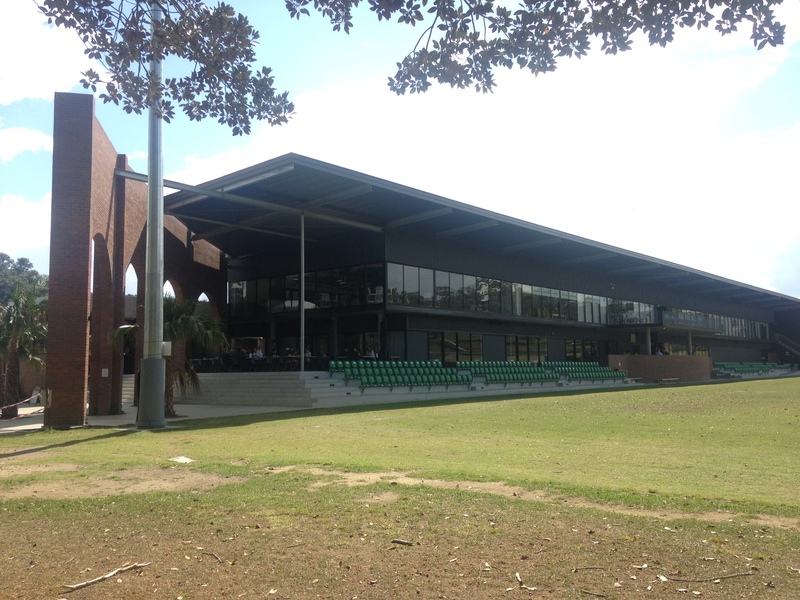 Monolithic, coliseum-like arches form the threshold and cradle to the Wests Bulldogs Rugby Club (Wests). Opened in time for the 2017 season, the almost eight million dollar redevelopment has been orchestrated by Richards and Spence; constructed by Hutchinson Builders. 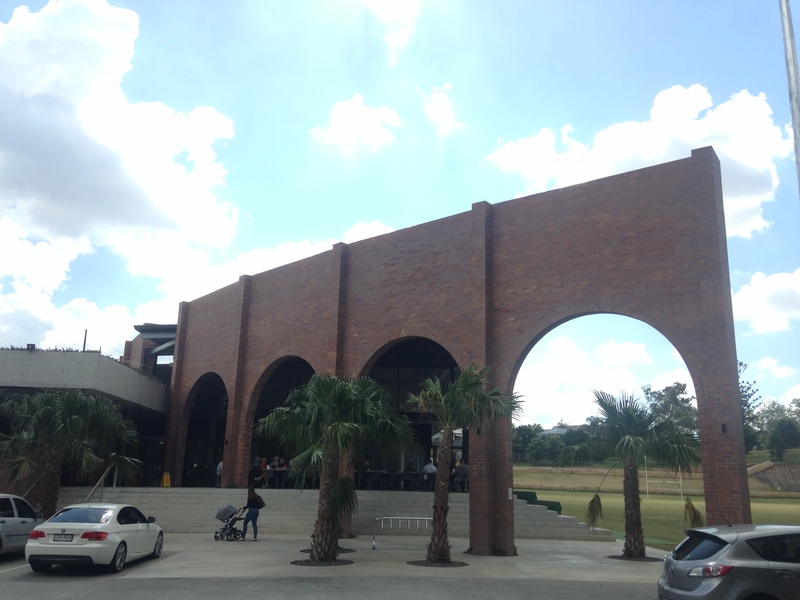 In Richards and Spence’s signature brickwork, these arches form a conversational line between the heritage of the fig trees lining the playing field and the contemporaneity of the newly-redeveloped clubhouse. Wests have been around since 1951 as part of the Queensland Premier Rugby competition and have spent the last 50 odd years at Memorial Park on Sylvan Road. The heritage-listed Memorial Park first opened in 1918 and was dedicated to the 101 locals who enlisted in the Great War. Wests have used these grounds so long they are not simply the lessees, but a part of its fabric, undoubtedly enjoying their role as caretakers of this very local legacy. Couched in the shadow, breaking the line of these ruinous arches is the Georgia Cannon-designed café Pitch + Fork. Owned by Kim Malouf, of nearby café the Corner Store Café fame, it occupies a small, though privileged footprint at the entrance to the clubhouse. Situated between the football field, the carpark and the clubhouse, and dominated by its Roman-like threshold, Pitch and Fork’s positioning looks to the south west. The heart of the café containing kitchen, pastry cabinet and indoor seating is on the left as you ascend the stairs. To the centre and right is outdoor dining, orchestrated from an island counter and arranged linearly. 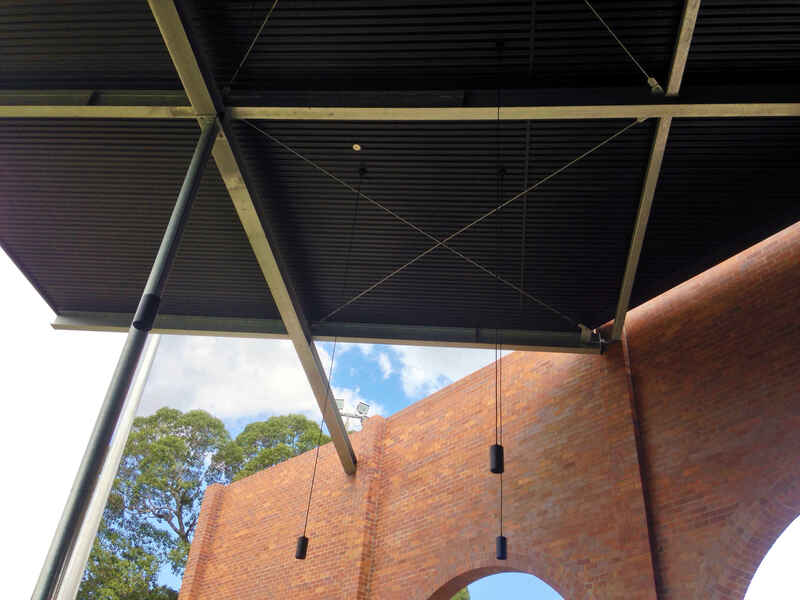 Sitting at times in the shadow of the larger structure, Pitch and Fork is dominated of course by the arches, but also an enormous unlined corrugated roof, framed in steel – like a ceiling-less Queenslander; a gazebo you’re lying under, squinting through the tight-knit canvas at the sun above. It’s pinned over and against the black-clad clubhouse, which isn’t menacing as much as bearing the confidence of a rugby team assembled before the first whistle. It’s an exclusive welcome that begs your attention. This is rugby after all, there’s a reason we’re here and it’s there on the field where the great game takes place. Not only are we cowed by these enormous structures articulating the sporting mythos, but through drawn curtains and behind glass we see a separate, more formally-set function room. Pitch and Fork, initially, has the potential to seem at odds with its surrounds; a parasitic afterthought over a team player. 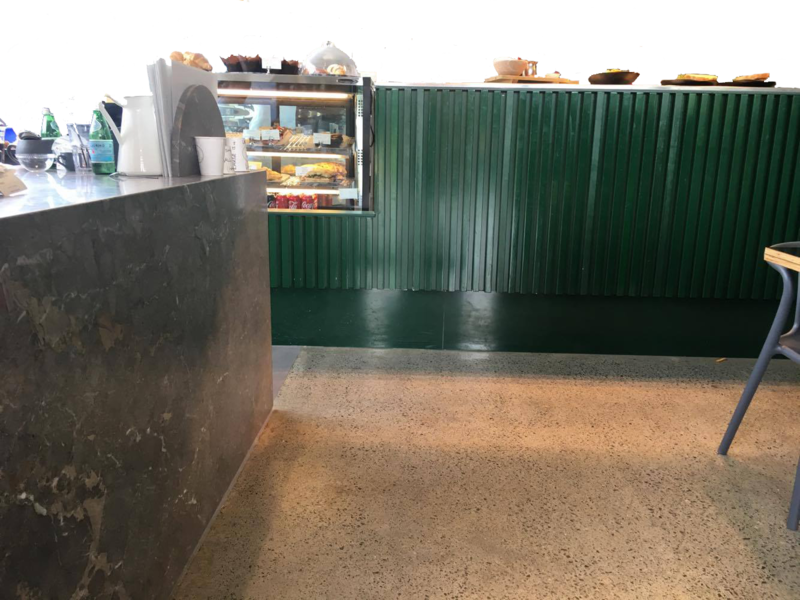 However, Cannon’s work – and it must be mentioned that she worked closely with head chef Dylan Brace and proprietor Kim Malouf – situates the café so well within the overarching structure that it is more an articulation of the Wests Bulldogs commitment to its locality. Pitch and Fork is sister to Corner Store Café and patrons of both will not find the similarities unchecked. The point here, however, is not one of repetition and reliance upon a proven formula, but rather the providence of familiarity and faith. These qualities are particularly favourable in what is by definition a rugby club, but more largely a vibrant centre of the local community. Cannon has situated Pitch and Fork within this institution. Materially, timber battening over the kitchen frontage is painted in the club’s signature green as well as couch seating opposite. Outside, the island serving counter is in this same green, overlooking the dining area. When sitting outside, with the tables lined up and facing each other, one is both shoulder to shoulder with and facing other diners and the feeling is that moment before a scrum, looking to staff for direction as one waits in trepidation for the moment of action. And it is this moment of action where faith is reaffirmed. 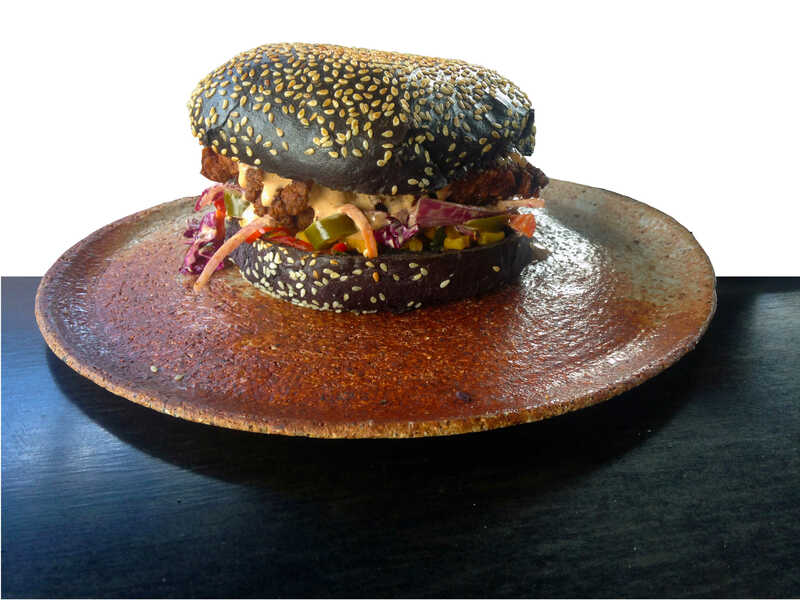 Meals are served on stoneware that is rough and grainy, like sods pulled from the earth—the same earth from which the towering brick arches and the polished concrete floor comes and indeed the same earth on which the game itself is played. The tableware is truly representative of faith and teamwork because it is the work of local ceramicist and The Corner Store employee, Fred Valentine. The working of practicality and poetry is a design cliché and let’s please not get ahead of ourselves. The artistry in Pitch and Fork is the same artistry one sees on the field; a perfectly executed manoeuvre that to the layperson is unnoticeable, but to the fan on the sidelines is akin to ballet. It’s direct, it’s pragmatic and it gets the job done, but with finesse above what might be expected from a clubhouse café. In the redevelopment of Wests, immense care was taken to reposition the field and clubhouse to its historical orientation; to maintain the heritage of Memorial Park and its many listed trees; and to be sympathetic to the half century of history and presence that Wests have built in the locale. On a micro-scale, Cannon herself has had to do the same thing, both within Richards and Spence’s work as well as in having to work and build within a structure that is so well established, familiar and dear to so many people. Undoubtedly it is a complex operation to build something that’s both new while faithful to what already exists – a place that speaks to brunch on a summer morning, to a steaming coffee on a cold winter’s day as the first whistle blows and to a burger and shake in post-game muddied jersey and pulled-down socks. The point and the core ethos of Wests isn’t in their premier team, it’s in the juniors and the seniors teams, in the diehard supporters and the community members kicking a ball in the off-season. Sport and design are similar in that they are both at their best when they’re playing for the community. Truly winning isn’t in taking home the premiership; it’s in having a place that people call home. Theo Landon is an Interior Design student at QUT and is a volunteer at the Asia Pacific Design Library.